Wild Honey Press, Bray, County Wicklow. 2003. There is a particular joy in Mairéad Byrne, a spontaneity difficult to find in other authors. Liveliness and a cheerful attitude - popping playful words /laughter, happiness and beauty/ from these lines, as much as a strong perception of all the possibilities given to someone who is a woman, young, brilliant, independent, and lives in a big town. The white and the black. In its fullness. To it there is the quick spirit of Byrne, her enchantment of life, her deepest consciousness of being a mother - responsibility as a teacher, her capacity of distancing herself from the world and of seeing it plunged into its sounds, movements, attractions and repulsions, of becoming every part of it, of detecting the relative absurdity of it all, together with an indirect sour comment which leaves in you that partaking of an unsaid emotional event with all its unexplainable and sometimes unbearable bitterness. Recurrent as if in dreams and/or nightmares are those streets, alleyways, which go up and down in all directions, windy - “wind gusting. It was always November or February or March” -, things disappear, they come back and go. The Irish streets ran by bicycle, upright with an ache in her thighs, “white breath billowing above the white road”; the American streets walked through, by scooter - public transports, “oesophageal traffic, streets keyed high with the shrieks of children”, or mental passages connecting people and events. We are caught into the meditative level accompanying the position of a person who has to fight against the pretentiousness of already allocated pieces in this colorful and often airy - but air of a tangible kind - mosaic to accommodate those who pull the threads most powerfully, not specifically at a political level. Thus here is Byrne with THE NEW CURRICULUM to explain you what she has learnt, how she is able to move around in our contemporary daedalian labyrinth, and how she got to avoid imminent ever-present disasters. There is her elegy to PUBLIC TRANSPORT and her beautiful gifts - a holiday to the Canary islands, toblerones and Milky Bars, medals, a boyfriend - to all those kids and their moms with the shopping, and the onions rolling at the turns of the bus, and the disarrayed unease of having to deal with it all in a single hectic day. and we are reminded of Shakespeare’s: “He is an honorable man” in Julius Cesar. when she can fit “an entire fish and chip shop” into hers, and here is the final line: “So there! My poem is full to bursting point! Beat that!”. Byrne’s anxiety enclosed in her visual poetic world lightly scrapes the long brilliant sequence of images with striking impressions because of their inborn lucidity, nothing can escape the sharpness of her intelligence. Often coupled with a keen sense of humor. I can almost see Mairéad marching out of the door of this incompetent doctor, “prescription in hand, which I filled ...”. And there is a longing for something missing, the intensity of which carries you away, maybe due to her living between two worlds, Ireland (her childhood, THE POOLS) and Providence, Rhode Island (her youth and maturity), or the consciousness of something lost, or the simple fact of being afraid, which as Mairéad Byrne says, rhymes with her name. Interesting within this context becomes the found poem: COMMON VERBS IN THE LANGUAGE, a list of the most used verbs in Irish. To follow A TYPICAL IRISH COTTAGE with its most musical therefore untranslatable central stanza “... rainbarrel plop and the crack of cement gutter’s drip and its drop and its struts rusted outlet...”, a vivid work of conceptual art. http://www.wildhoneypress.com/BOOKS/The%20Pillar_fulltext.htm, the almost imperceptible changes in her voice, characterized by a full rich round tone, lead you through what is always perceived but never expressed in her poetry. A willingly masked fragility behind the enlargement of what can be seen, masterfully described; or what cannot be seen, as in this specific case Horatio Nelson himself. With the centrality of the pillar (from a note we understand that it was “blown up by the Irish Republican Army on Easter Monday 1966), interpreted by Alan Sondheim as the pillar of language in its dis/location of location throughout the entire poem (http://www.wildhoneypress.com/Reviews/Sondheim%20review.htm). 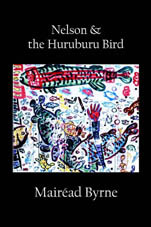 A long moment of poetry is NELSON & THE HURUBURU BIRD by Mairéad Byrne, for its continuous fragrance, surreal lyrical composition which finds expression through a most lively choice of strong musical terms, and which endlessly surprises you in its twists and turns, straight through and upside downs, direct emotional responses as much as concealed feelings, the loss of the central “I” and at the same time the precise image of Mairéad Byrne as she is - as if portrayed in a photograph, the richness of the arts all called to support the word in its limits but also in its limitless possibilities of expression and interrelation.